Light draws attention towards its shadow! Light glows attraction towards its pathway! Light draws attention towards its shadow! Light glows attraction towards its pathway! When darkness owns the dawn, candle light leads the brightness of the ambience! Candle light melts its attire to fascinate the eyes of power! Bundle of joy pelts the sadness to the dancing swirl of mourning! Seasons of twist and twirl shade the evergreen sparkle with candle light! Reasons of overwhelmed happiness brings twinkle with candle light! beauty to the person who lights the candle! 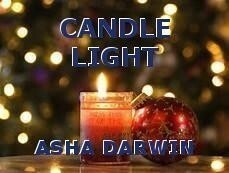 Candle light rains the shower of pearls to the diamond dew of ravishing love! © Copyright 2019 ASHA DARWIN. All rights reserved.